Inspired by an image on Pinterest of a miniature chandelier made out of a fish hook I gathered up some supplies and decided to give it a go. 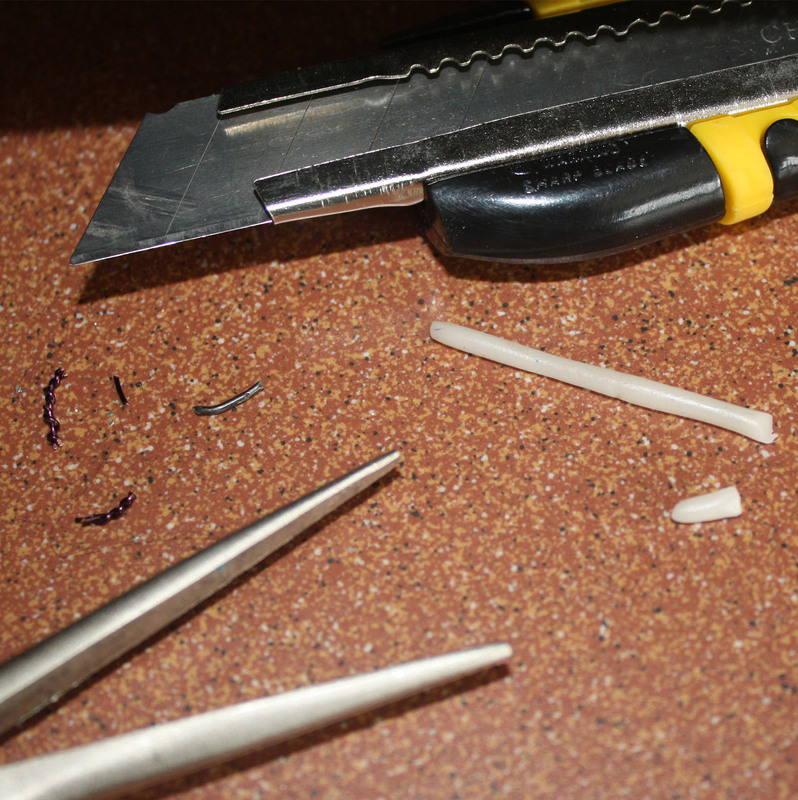 First off – who knew fish hooks came in such an array of sizes. I decided to buy several sizes but settled on one about 1 1/2″ high for my experiment. Step one -squeeze those nasty little barbs on the fish hooks until they are good and flat ( pliers) and nip the pointy ends from the hooks with a a little wire cutter. I picked up some clear seed beads and some larger clear beads as well as some even larger colorful beads. 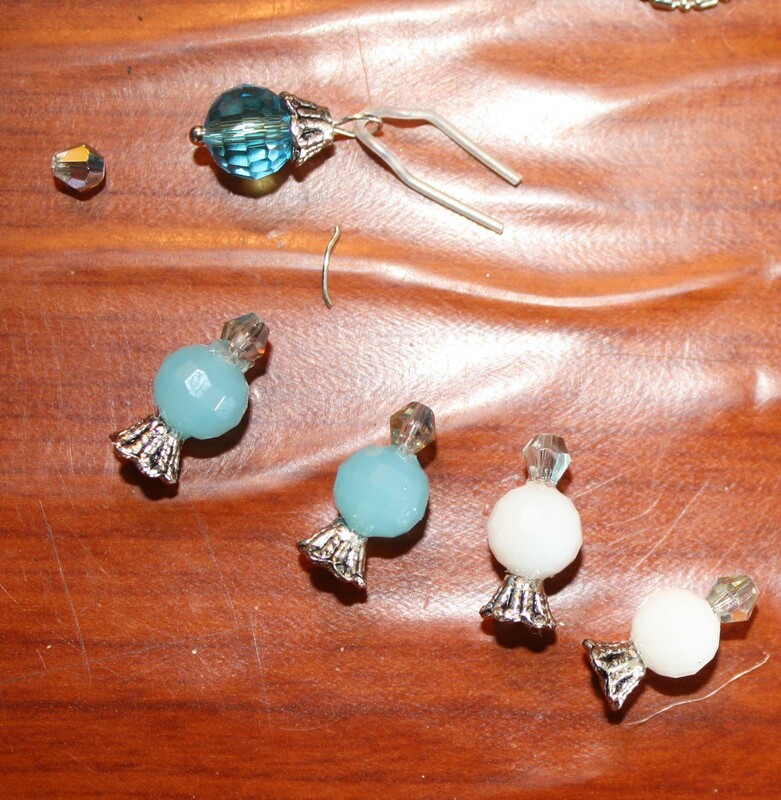 For the larger beads I looked for ones with a bead cap that could be used as a candle drip catcher. Step Two – I pre-assembled a few items. 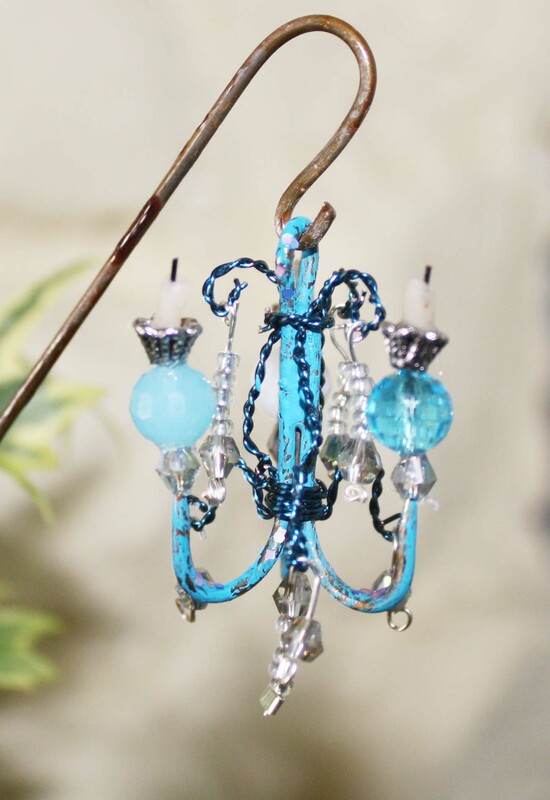 The largest bead was dismantled, reassembled and embellished with a small clear teardrop bead to form the part that would attach to the top of each hook and eventually hold the candle. The hole in the tear drop bead fit over the hook a little making that part easy to glue. A few strands of beading wire with curled ends were used to make the three pieces that would attach to the middle of the fish hook where beads would later hang. 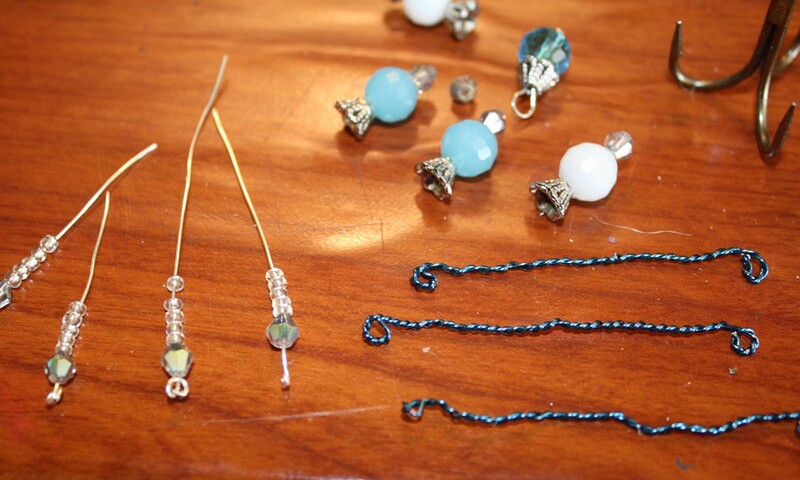 More beading wire pieces with a tear drop and several seed beads were made ready for hanging as well. Step 3 – Assemble. Easier said than done 🙂 I painted the fish hook first. Much of the paint rubbed off during the assembly – and I’m going with the “I meant to do that story” and calling it shabby chic! I started in the middle with the three pieces of twisted wire with curls at the ends, poisitioning them evenly around the middle post as best I could. Then I twisted a bit of wire around the bottom and top of the group. I pulled and poked and eventually shaped the twisted wire into a shape I found pleasing and that would allow me to hang beads out away from the post, and then tightened the wire I had placed at the top and bottom. After the bead chains were hung and the larger beads glued to the hooks it was time to make the candles. Premo translucent clay was used for making the candles. I just rolled out a thin snake, cut a few little pieces, poked a tiny bit of wire in the end and popped them in the toaster oven. Glue. Sometimes the best things come from just starting a little experiment and letting it take you where it will. 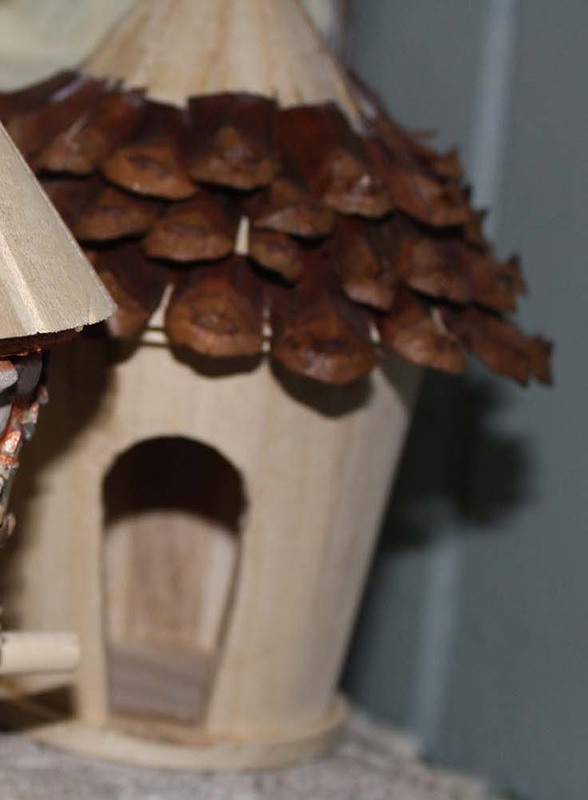 I often see cute plain wood bird houses in the dollar store ready for decorating and think there must be a way to turn that into a fairy house. I’ve brought a few home and today I decided to tackle one and see what would unfold. I also had some pine cones stashed away so I started by getting out my garden sheers and tearing it apart into pieces for a roof covering. While doing so I was eying up the bird house and wondering how I could get rid of the perch sticking out . 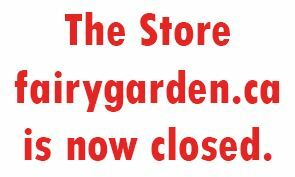 I took my garden sheers to it and sure enough , that worked. The wood seemed quite soft so I then used a box cutter to cut the bird hole into a doorway shape. I added a little artificial moss to the roof and was thinking I wanted something twiggy to happen next. Then a lovely woman from PEI called and asked If I could paint some fairy houses with some lively colors for some young children coming into her life and suddenly I wanted color. 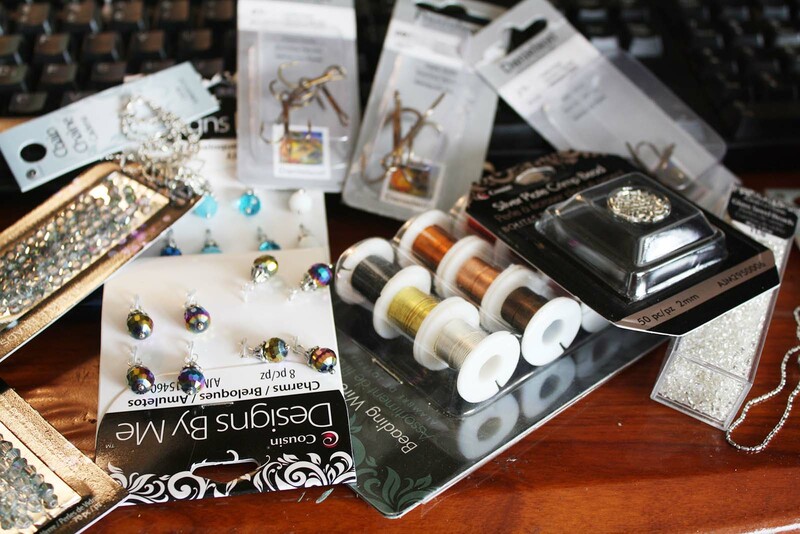 I also had a notion to incorporate some twisted wire and nail polish ideas I had played with lately. The result was a somewhat disjointed looking mess but I did not despair. I liked the happy color and decided to white wash the pine cone roof..add a poly clay door frame and a window. The thought came that it was getting a bit of a beach hut look so I went with it and made the window a fish shape. From no where really, I thought I could make the funny wire nail polish thing in the doorway fit in by adding a ‘bead curtain’ of wire and clay. The brown moss got touches of preserved brighter green moss to color it up. A final touch was some clay flowers hanging from the roof like patio lanterns. 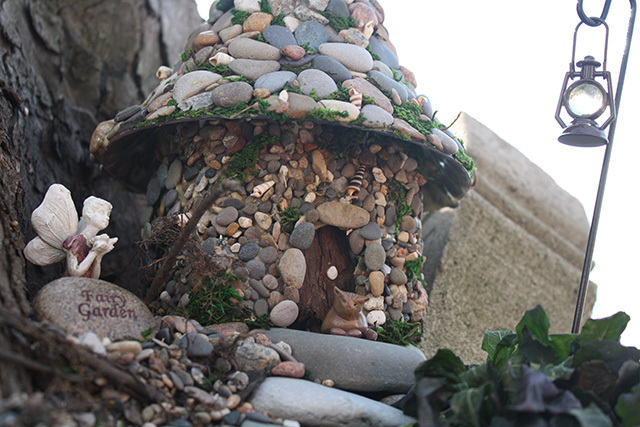 And there it was..my experiment had morphed itself into some kind of beach hippy love hut fairy house. Not at all what I started out to do! So experiment..and as always , have a fairy good time, Marthe And thank you to Mary from PEI for coloring my day! 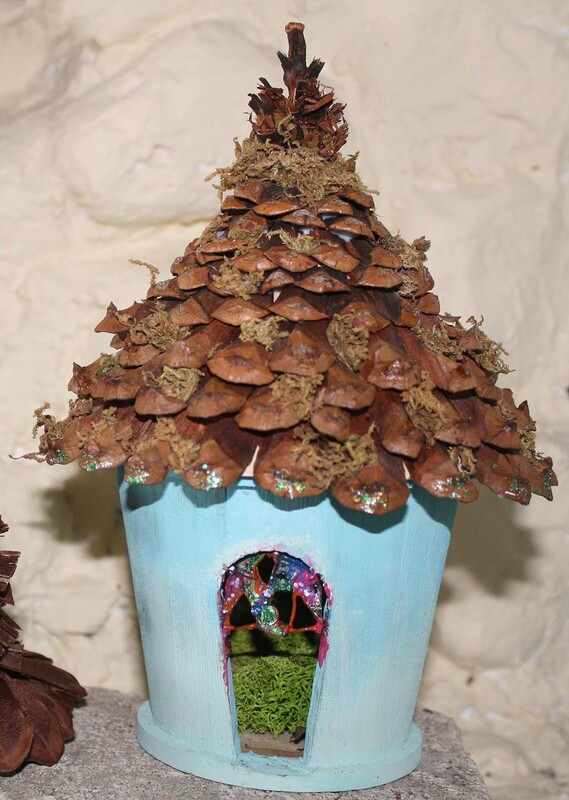 Do you want a fairy garden but have two brown thumbs? It can be done. I have two suggestions; artificial plants and flowers, really easy care inexpensive plants. 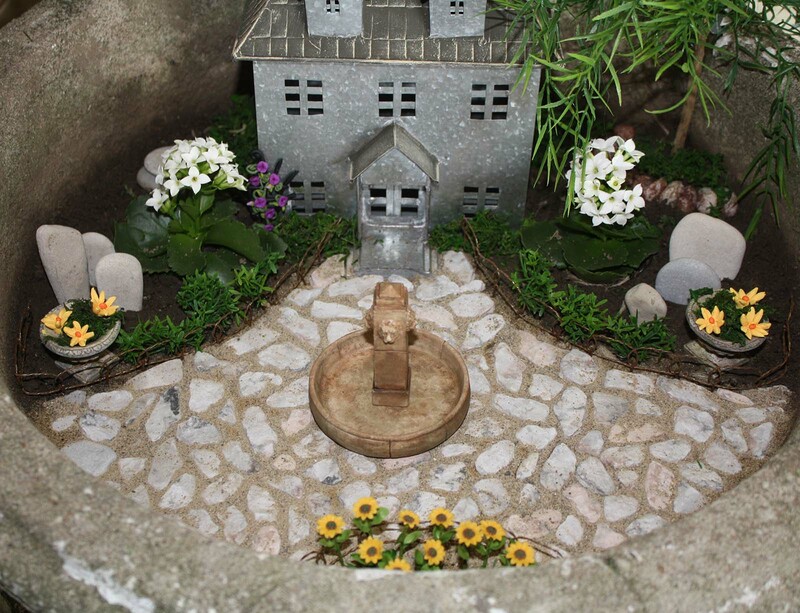 This fairy garden uses mostly artificial plants and flowers. The sunflowers in the foreground are commercially made miniature sunflowers. I’ve augmented them a little buy cutting little pieces from an artificial fern and tucking these in around the bottom. I wrapped a bit of wire around the bits and pieces to make them into little picks to make it easier to insert them into the soil. I used these along the edge of the stone walkway for a hedge affect as well. The tree was also made from an artificial fern (from the dollar store) I butchered and reassembled it on some twigs from the yard to give it a nice tree appearance. The other yellow flowers and the trellis with purple flowers near the fairy house door are made of polymer clay and are very easy to do. I’ve tucked a bit of artificial moss under the yellow clay flowers, under the windows on the house and under the tree. 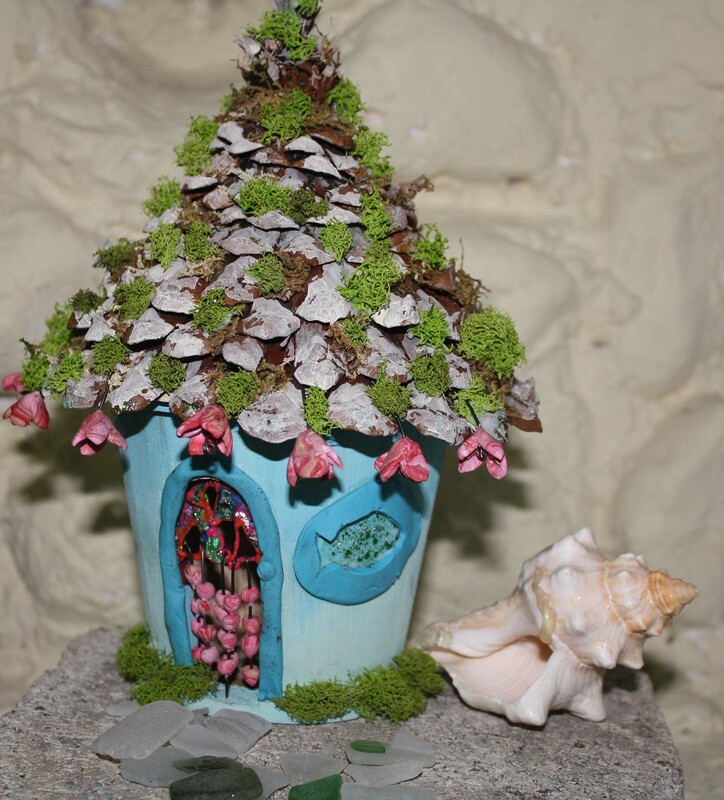 Making your own fairy garden accessories is fun, easy and cost effective. Here’s a really quick project that you can do yourself or do with kids. Cut a shape from the foam to build your path on. Paths that are meandering look nice. 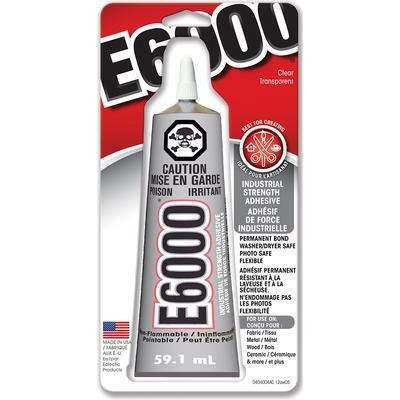 Use glue to attach stones in a mosaic pattern – swirls, circles, flowers, a twisting tree… whatever you dream up. Fill in any little gaps or holes with a dab of glue and some shredded moss. Here’s a pic of mine:) Have a fairy good time!